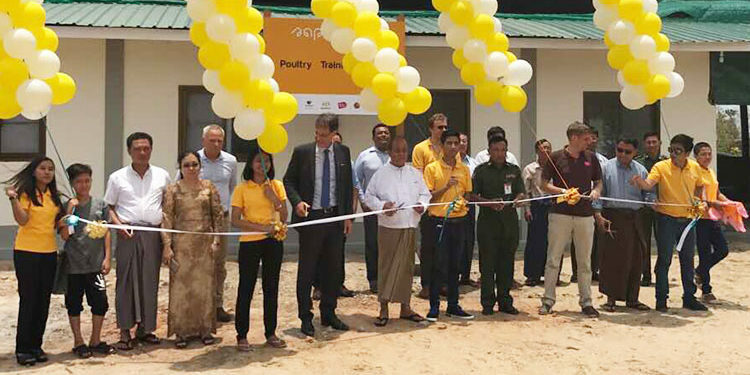 On the 16th of May, the 2nd Poultry Training Centre (PTC) of the SAPA (Sustainable and Affordable Poultry for All) project was officially opened by the pro-rector of the University of Veterinary Science Dr Ye Htut Aung, the Chairman of the Nay Pyi Taw branch of the Myanmar Livestock Federation and the Agricultural Councilor of the Netherlands Embassy in Myanmar. 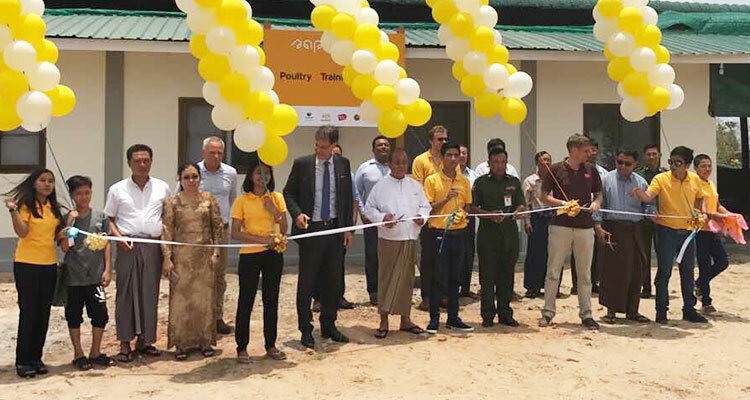 Before the official opening, the brand-new meeting room was used for a workshop with local broiler farmers, where the director of De Heus Myanmar, Mr Johan van de Ban, together with the De Heus farmer extension program manager Ms May Zin Myo (Jemi), introduced the SAPA project and the broiler farmer training program. Dr Ernst Beitler from the AERES University of Applied Sciences from the Netherlands, a hands-on experienced broiler production specialist, explained to the workshop participants that within the SAPA project a choice was made to develop the Poultry Training Centres on carefully selected existing broiler farms. Based on a design of Dr Beitler, these farms were upgraded to be compliant with the minimum required level on biosecurity and hygiene, and being equipped with the required facilities to train the broiler farmers. 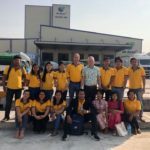 The reason that the SAPA project has chosen for this model, is that the to be trained broiler farmers will learn in a real commercial farm setting. 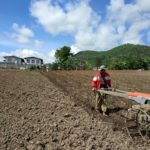 This is different from the usual model, where farmers are being trained in a demonstration farm, but which is not being managed as a commercial farm. As Mr Beitler mentioned: “Farmers are much more likely to adopt best practices and innovations which they see in a real commercial broiler farm, explained by a real broiler farmer, then from a farm which is only used for demonstration purposes”. The most important criteria which were used in selecting an existing broiler farm for the upgrading to a PTC, was the motivation of the farm owner to receive other farmers, share information and understand the power of learning from each other. The selected broiler farmer for the 2nd PTC is Dr Ko Ko Naing. Dr Ko Ko Naing already has a lifetime of experience with poultry farming. His father was a layer farmer in the Irrawaddy Delta. Already from a young age Dr Ko Ko Naing was helping his father on the farm. With this background, it was a logical choice for him to study at the University of Veterinary Science in Yezin. After his graduation in 2001, he first worked five years for a feed company, which was also active as broiler integrator. This work experience gave him the confidence to start his own broiler farm from scratch. Together with his wife they successfully developed their farming business step by step, to the current production capacity of 150,000 broilers per cycle. 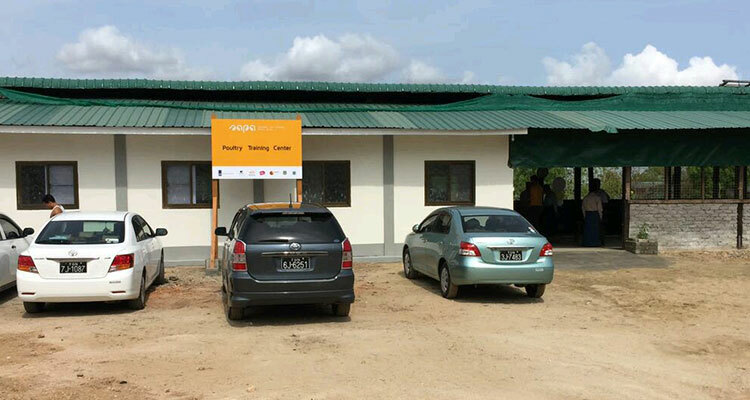 With the money which they earned from the broiler farming, they invested in a small and basic broiler semi processing facility to supply the Nay Pyi Taw market. Dr Ko Ko Naing passionately stated: “I joined the SAPA project and made one of my farms available to become a PTC, because I want to help the broiler farmers in this area. I also see this as a great opportunity to get my own staff well trained. I really want that the 300 broiler farmers in this area get the knowledge to build a good business”. At the day of the opening most broiler farmers told that at this moment the broiler prices were relatively good, about 3,300 Kyatt/Viss, which is about 600 Kyatt/Viss above their cost price. Their biggest issue with which they have to deal with in this period is the heat stress of the broilers. Dr Beitler responded to the heat stress issue mentioned by the broiler farmers: “This is why it is crucial for the future of the broiler sector in Myanmar that closed broiler housing systems will be developed, which will allow much better temperature control with special, but relatively simple, ventilation systems. Another big advantage of a closed housing system, is the much better biosecurity control”. Dr Ko Ko Naing is indeed planning to invest in the first pilot closed housing system in the area to get experience with this. This will also be a very interesting pilot for the broiler farmers who are joining the training program. A lot of them have heard about closed housing systems, but have never been able to see one. To develop closed housing systems will require access to finance, as most broiler farmers will not have enough capital at this moment to make such an investment. 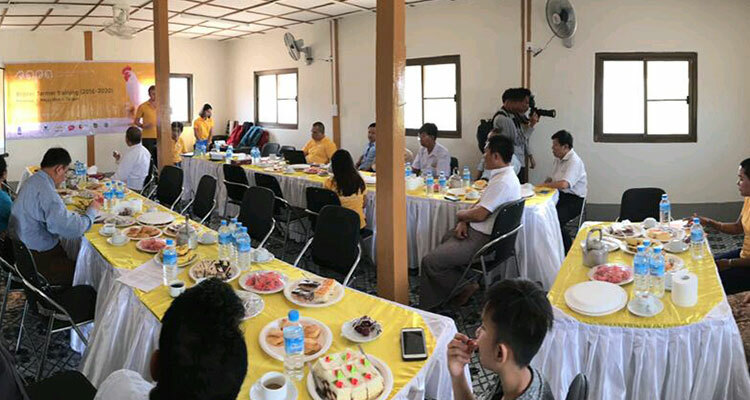 Although closed housing systems and access to finance is not in the scope of the SAPA project at this moment, the project partners will explore possibilities in the future to link existing and ongoing programs in Myanmar regarding credit for small holders to the SAPA project trained broiler farmers. Immediately after the opening event, no time was wasted, as this was the starting point to train 250 farmers on the issues of farm management and bio-security. Crucial aspects in the breeding of a healthy chicken as stressed earlier. 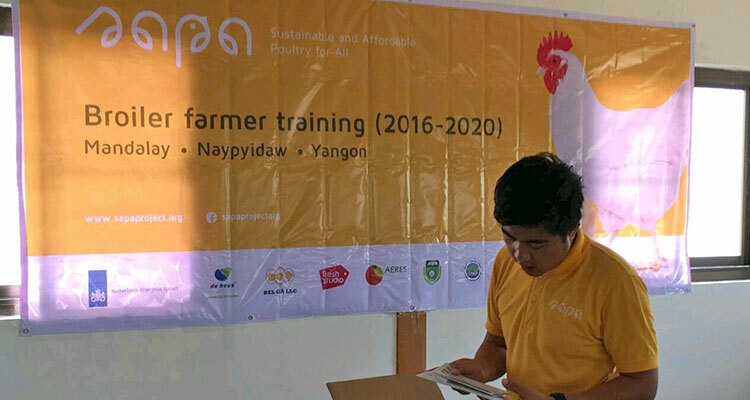 The training of the 250 farmers is not only taking place in NPT, but also in Mandalay, at the first PTC of the SAPA project, and in Yangon. Depending on the location of the farmer, he/she will be trained at the nearest location. The 250 farmers will be trained by fifteen veterinaries of the De Heus broiler farmer extension team, who are trained and supported extensively by Dr Beitler in broiler farming production practices. This training is one out of three training courses to be conducted to the 250 farmers, where after 500 farmers are being trained on similar topics.